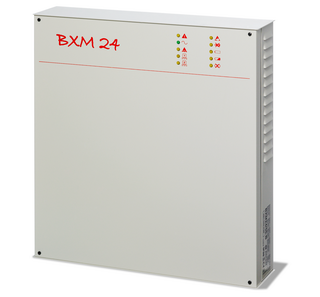 The BXM24/25-U and 50-U are approved by IMQ to EN 54-4:1997 + A1:2002 and EN60950-1:2001. The steel housing contains a 2,5 amp or 5 amp switch mode power supply and monitoring board and has space to accommodate 2 x 12V 17Ah sealed lead acid batteries. The 10 front panel LED’s comprehensively indicate the status of the unit.